I wanted to have this post up on Friday, but I have been fighting a bad cold for the past couple of days. For the first post in this ongoing series, I decided to go with something that is not a toy, but a work of art. 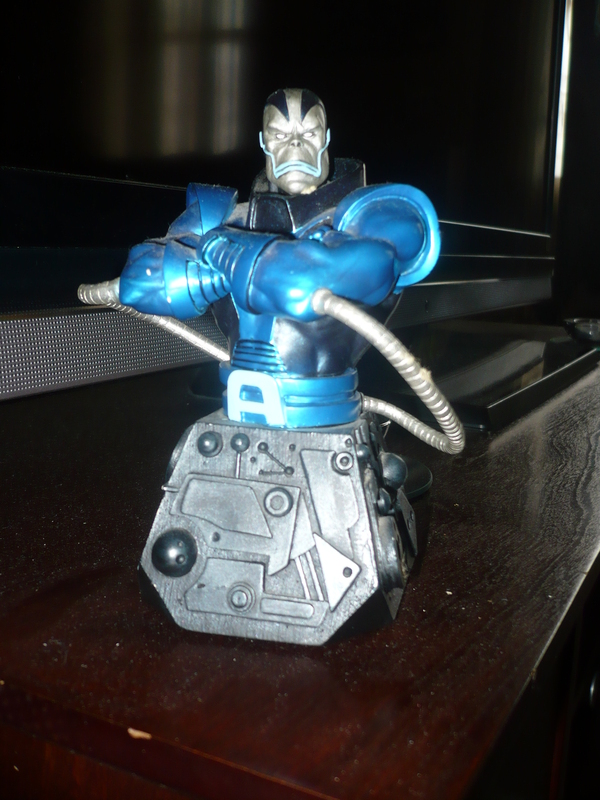 I bought this mini-bust at Midtown Comics sometime in 2000 or 2001. I used to visit Midtown Comics every week to get my comic fix. Well, one day I went in and checked out all the mini-busts and statues that they had in a glass case. Apocalypse, being my all time favorite villain, caught my eye quite quickly. Not being one to spend a large amount of money on a single item, I perused the rest of the store, to give me some time to think it over. A short time later, I approached the counter with a few comics, and was asked, “Can I help you with anything else?”. I replied with something like, “Yes. I would like one of those mini-busts in the case over here.”. Ten or so years later, I still think the $55.00 I spent on it was well worth it. And for those wondering, this is numbered 1993 of 5000.